I am going on another climbing trip so any communications through email or facebook will be very slow as I will be off the grid until Tuesday 5-Mar-2019. I've added a new Inventory section to the site. This section will allow you to add current inventory to your cart. As long as there are no other non inventory floats in your cart, you order will ship right away. I am going to try and build up some inventory but I find it very difficult to get ahead of the orders. We'll see how it goes. I can no longer promise to have any more orders for 2018 arrive before xmas. Sorry for the inconvenience. I am cutting back on shop time for the next couple weeks. Starting 6-May I will stop shop activity all together for about a week or so. I'm going fishing. I'll respond to any communication but probably not right away as I'll be roaming the earth, in and out of cell coverage, looking for Chrome! For some of my returning customers, you may notice an upgrade to the cart program. This is make you shopping experience a little less back and forth with PayPal. I also added a new product line. Yes that's right, another bead company. Nothing special about my beads. I am buying the same beads from China that everyone else is, I am just offering them a little less expensive is all. Are my beads better? Probably not. Are my beads Superior? Damn Right! I have limited section to start but the colours I do have, have proven to work very well for me. So if you already have a bead guy, that is fine, but while you're here buying floats, you might as well fill the cart with beads too. I am nearing the end of a large order so my lead time is now a little quicker. I am running about 1.5 weeks to complete an order. It's that time of year again and things have been very busy in the shop. My lead time at the moment will be about 3.5 weeks or so. I'll update this news feed when that changes. I found an issue with the new Lil Slips not being able to be added to the cart. It has been resolved. As well, I updated my pricing for this year. REDUCED! Hi everyone, I will be shutting down the shop for a couple weeks while I go fishing. If you place an order it will be placed in the queue and completed in the order that it was received. Communitcation will be limited an dbased on any cell phone reception I may find while I am on the river. Tight Lines everyone! I have decided to add a new style to the ever growing lineup. I'll be offering the Lil format in a slip float. 2.5g, 4g, 6g, 8g, and 10g will be available. Due to increasing costs I can no longer accept order with a total quantity less than 4. They don't all have to be the same float, you can mix and match as you please, but the final quantity must be at least 4. Thank you for understanding. New Lil Trotter Sizes Added! I have decided to add 2 new size options for the Lil Trotter line of floats. The 8g and 10g sizes will now be available. I have also added a few new designs. I have a few more in the works as well. Just in time for Christmas. I'll also have 1 new river net avail. as soon as I have it completed. I faught it long enough and I finally decided to offer the Loafer Slip float as a fixed stem float as well. This option is available with the entire line-up. Things are heating up in the shop. I just added a few new models and I added a new option for each model. You can now choose your top colour for most of my designs. The colour choices are Orange, Pink [NEW], and Chartreuse. Some of the models, like Green Machine, do not work with other top colours so those options have been left out. Have fun creating your new Float collection. The fish have arrived so I am going to limit my time in the shop for the next few weeks. Any orders received will get completed in order they are received, but only when I have time. Normal turn around for an average size order is about a week and a half. Count on double that time until end of May. Thanks for understanding and your patience. I am back from my adventure in Iceland and will start plowing through the orders. Thanks for your patience. I will be suspending shop activity until 8-Feb-2016. I am going on a climbing adventure to Iceland and now I need to concentrate on organizing and packing. Plus I want to spend as much time with family before I leave on the 25th. Any orders received during this time will be put in the queue and completed in the same order as received, starting on the 8th. 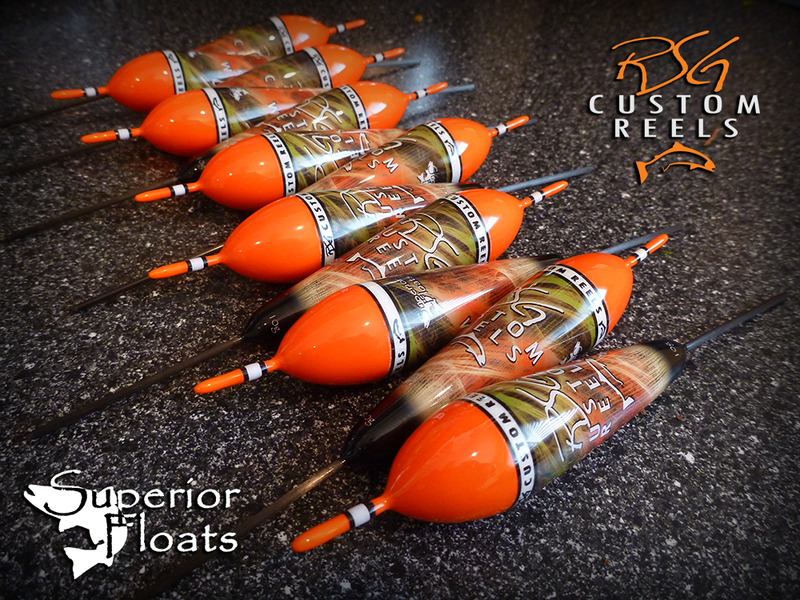 So if you would like to ensure that you have your floats for the spring run, get your order in ASAP. I don't know how much internet I'll have while I am away so I'll likely won't return any communications or order confirmations until I am able to check email. It won't be ready for Christmas but maybe early in the new year. I am almost finished a new net I have been working on for quite a while. Not sure I'll make this again as the work involved is way too great to actually make money on but it sure is turning out nice. This net will go straight into inventory and available for purchase. Stay tuned. I've added a new section to the products I will be offering. Custom wooden landing nets will now be offered. Check it out. I am very proud to have been chosen by RSG Custom Reels to produce a set of floats that will accompany this years collector reel. RSG Custom Reels are truly a work of art and the builder is second to none with his keen sense of style and unmatched flair. To have been chosen from a handful of quality float builders to produce this set is an absolute honour. I am proud of the finished product and I believe he was too. Please take the time to browse on over to rsgcustomreels.com and check out his work. Well my Steelhead season is over. I had a decent go of it this year and landed 100 Steelhead. 90% of them were caught while testing out the foam floats. I really enjoyed fishing the foam floats and will likely switch to foam exclusively. I will make avail the option to choose foam over balsa. Where I see foam to be superior to balsa is in the smaller rivers and shallow water. Foam is a little more buoyant thus allowing me to make the floats smaller. Smaller means lighter so that, in my opinion, is a less desirable trait in fast flows and large rivers. Casting distance is reduced and stability in rough water is diminished. I would use my balsa floats in those conditions. I am putting the brakes on in the shop. I'll put any orders the arrive in the queue and they will be completed in the order in which they arrive. As of 11-Mar I will be on holidays until 19-Mar. In the timeless words of the immortal Matt Foley, I'll be living in a van down by the river." Cheers, and tight lines everybody! It is almost "Go Time" so don't hesitate. If you want to have new Superior Floats on the end of your line for this springs run, order now because things are going to get busy over here and I will be plowing through the orders as they are received. Once the rivers are flowing I will be taking about 3 or 4 weeks off from the shop to go fishing so ordering will be suspended during that time. Canadian Dollar In The Crapper! Well it doesn't look good for the Canadaian dollar right now. Why am I reporting that you ask? Well what that means for our friends south of the border with a US paypal account is extra savings. My last check, the Canadian dollar was at .76 USD. That is almost 25% off regular price. Better snap that up before the spring run. I suspect things are going to get busy and the wait time is going to be longer. I am also planning to shut down shop once the rivers open up so I can go fishing for a couple weeks. :) That's just how I roll. I finally had a break in the order to complete my new website. 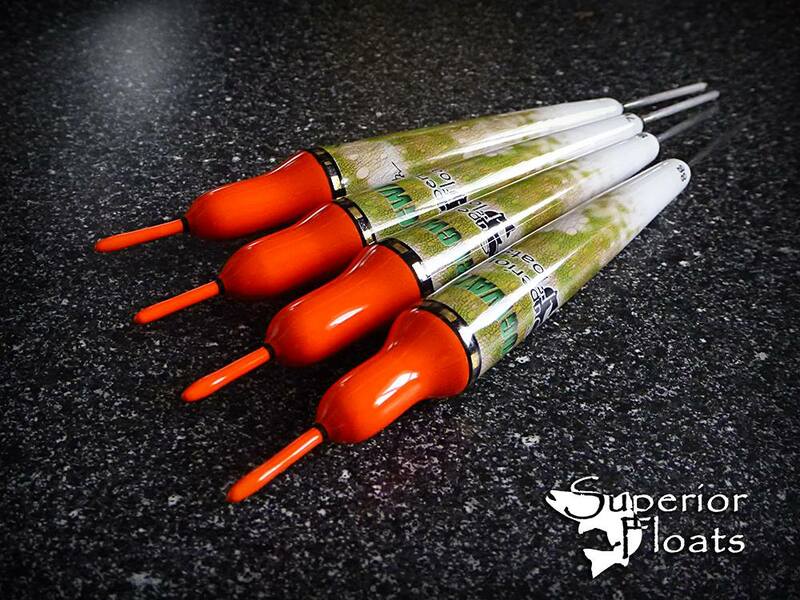 I hope this new site makes it easier for you to complete your purchases and to find information about Superior Floats. Drop us a line if you have any questions about our floats. Thanks for visiting.